The AaquaTool ToteBlaster LT, IBC and Tote Cleaning System is designed to wash and rinse the interior of totes and containers. Perform (in-house) intermediate bulk container (IBC) cleaning in less than half the time, with the ToteBlaster LT Station. This high impact cleaning technology ensures the entire tote interior is thoroughly cleaned in the most efficient manner, utilizing the least amount of resources, including time, labor, energy, cleaning chemicals and water. Simplicity in design and affordability, coupled with the most durable and effective technology, makes this the ideal IBC/tote cleaning system for any industrial or sanitary application. 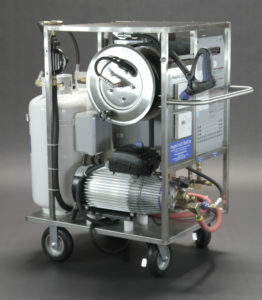 The system comes equipped with everything needed to setup an IBC/tote cleaning station; just add your pressure washer, 4 gpm or greater (greater is preferred). The AaquaTool ToteBlaster LT can achieve extremely high labor productivity per man hour through automation and using the latest technology in water-based cleaning solvents. Thus, man-hour resources can be more efficiently utilized.